In Nutrition and Cycling, you were invited to work out Andy's calorie needs on a ride from Land's End to John o'Groats. If you haven't already done so, print out a copy of these cards. Andy is competing in a Land's End to John o'Groats race, and YOU are his coach! You are determined that Andy will win the race, as long as he is willing to cycle for more than 7 hours a day. What is the shortest time in which Andy could complete the ride, if we ignore his 7 hour daily cycling limit, while making sure his energy needs are met? You may wish to consider minimising the cost, and/or the weight that Andy needs to carry, together with any other appropriate constraints that occur to you. NOTES AND BACKGROUND: Sport nutrition is a specialist field, and there are hundreds of products such as drinks, gels and bars for an endurance athlete to choose from. In reality, there are more factors to consider than calorific intake, and a cyclist cneeds to balance carbohydrate intake for basic energy, protein intake for muscle building, muscle glycogen reserves, maximising recovery speed and keeping hydrated: all important factors to consider. 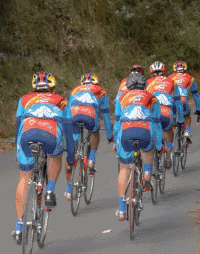 You might find this article, describing the diet of Tour de France cyclists, of interest. Cycling image from Wikimedia Commons, uploaded by Evdcoldeportes, released under the Creative Commons Attribution-Share Alike 2.5 Colombia license. Calculating with ratio & proportion. Physics. Maths Supporting SET. Sport. Approximate solution by numerical methods.. Biology. Optimisation. STEM - General. Chemistry. Area - triangles, quadrilaterals, compound shapes.